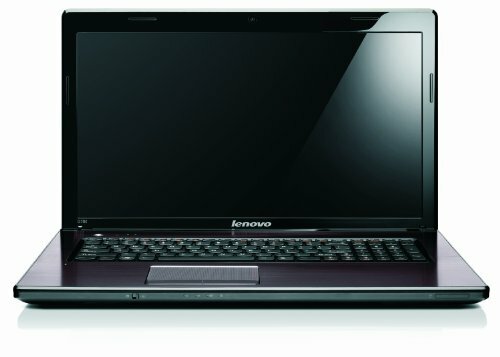 The Lenovo G780 laptop is a low-priced notebook with a substantial 17.3" display, Intel's Pentium B970 processor operating at 2.3GHz, 4GB RAM, a huge 500GB hard drive - enough space for your music, files, software and films, a DVD drive, and a webcam, all running on Windows 7, for under £320 - on face value this is a bargain. In our G780 review, we look at this notebook to see how good it actually is. Below is our review of the Lenovo G780, a 17.3" laptop, featuring 4GB RAM, 500GB hard drive and Windows 7 Home Premium 64-bit. The first thing you notice about the Lenovo G780 is the 17.3" display - pretty rare for a laptop in this price range - most are only 15.6". The picture quality is very good, very crisp and rendered colours well. The downsides of having a 17.3" laptop are that it will be larger and heavier, as well as use more battery power - so bear these factors in mind. The positives are that you get a larger screen, so more comfortable for working at and watching movies, and usually the keyboard will be slightly larger to match the increase in size of the casing. The speakers aren't bad, offering good sound quality in our opinion. The casing looks very good - however it does have a tendency show finger prints - not a massive issue, but bear this in mind before purchasing. The processor is from Intel - the Pentium B970, operating at 2.3GHz - the laptop starts up fast, and ran multiple applications without any issues - at this price range it won't play the latest games at the highest settings, but for the majority of other less intensive tasks, you won't have any issues. 4GB RAM is fitted as standard, to compliment the Intel processor. Battery life is fairly reasonable, at around four hours from our test usage which consisted of average web, work and gaming use. You can customise your battery usage with the inbuilt power saving settings. The whole notebook runs pretty quietly - the fan kicks in occasionally, but nothing that is too intrusive - most of the time it is fairly silent. You are provided with 4 x USB, HDMI, Ethernet, VGA, microphone and headphone, as well as a DVD drive and webcam - so plenty of options for you. The keyboard and trackpad were accurate and comfortable to use - the keys have a decent action to them, and when coupled with the larger screen will make this notebook comfortable to work in front of. The trackpad is slightly textured, with 2 buttons, and performed well throughout the testing period. Weighing approximately 3kg, and measuring 41.6cm by 27.3cm by 4.5 cm, this laptop isn't tiny - so may not be best suited to flying / travelling with - however for those who are more stationary, it will offer good performance at a low price. Inside the box are the Lenovo G780 laptop, a power cord, and a user guide - so you can be up and running in very little time. Pros: Pros: Large screen, performs well, ideal budget student laptop. Cons: Cons: 4 hours battery life, a touch large and heavy compared to a 15.6" equivalent. Our conclusion: the Lenovo G780 offers a lot of laptop for your money - if you need a 17.3" laptop on a budget, the G780 could well be the one for you.